You may have noticed in the title of my post that my weekly yoga focus actually covers two weeks instead of just one. Well, folks, that’s because I am taking a nice long weekend with my husband and daughters this coming weekend to hit the beach. And then the day after we come back from there, I have to fly to Nashville for a business trip for five days. So my teaching schedule is all jacked up for the next two weeks, where I’ll only be teaching two days. Don’t worry…I’ve got coverage for my classes, so you can still come and get your yoga on…you’ll just be with someone else while I’m away. I’ll be teaching as scheduled this coming Wednesday (5/30), but will be having a sub the next Wednesday (6/6). I’ll have a sub next Sunday for both my classes (6/3), but will be back to teach the following Sunday (6/10). Oh, and I’ll also be subbing the Power Yoga class at the Fort Mill YMCA on Saturday, 6/9, from 10:00-11:30 a.m., so join me there if you can. Anyway, since my schedule is a bit reduced these next couple of weeks, the theme will carry over both weeks. And I think it’s actually good, because I think the theme is something we can all stand to keep around in our lives for more than just one week. The theme is “Find the Cure”. The cure? What do you mean? Cure for what? Allow me to elaborate. Many times when we think of “curing” something, we immediately jump to sickness or disease. But sometimes, it’s as simple as needing to cure certain habits, attitudes or thoughts. Sometimes we get so “stuck” in these areas, and not necessarily for the better. After all, how many bad habits do you have, for example? I know that I had the very bad habit of drinking soda and eating lots of tortilla chips. But almost two weeks ago, I started following a medically supervised diet, and had to cut these things out (along with several other foods I absolutely LOVE!). I have to admit, I cried a little bit when I found out I could no longer eat my beloved nachos with melted shredded cheese. And lately, my attitude and thoughts have not been on the positive side the majority of the time, because I’m very frustrated and stressed about my health. I came across the quote above recently, and it really hit home for me. When I thought about it, it is SO true…at least it is for me, anyway. When I have a great workout…one that really works up a good sweat…I always feel better and more positive after. Same thing when I cry…sometimes, I will intentionally watch or listen to something that I know will bring on the tears, because I know that having a good cry always makes me feel like I’ve shed a million pounds from my shoulders. And the ocean is something I love dearly. 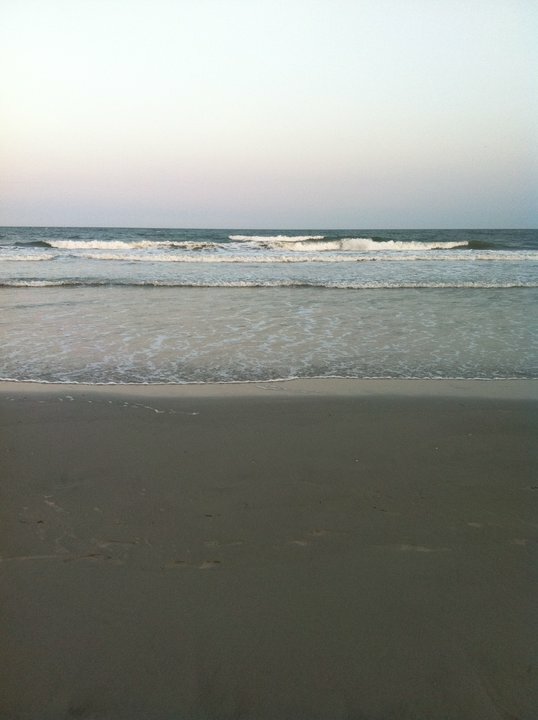 I grew up near Virginia Beach, so the ocean is part of my blood. The sound of the waves is like a meditation for me…I love timing my breaths to the waves as they roll in and out. And the salt water always makes me feel cleansed and detoxified. This past week, I was able to get in several great workouts, where I really worked up a great sweat. Yesterday, I had myself a good cry. And today, I woke up feeling a bit better. My attitude seems better today, more positive. And I am hoping that next weekend at the beach will be that one last piece I feel like I still need. Hopefully, I can keep it up, getting my “medicine” by continuing to exercise, crying a little bit here and there, and sneaking away to some water (though it may not be the ocean) once in awhile to catch the sound of the waves. In our yoga classes, the most obvious “salt water” we will come across is our own sweat. If you come to the Power Yoga classes or the Yoga for Athletes class, you’ll sweat for sure…getting rid of toxins and extra calories your bodies don’t need. If you come to the Deep Stretch class, you may find that you are able to open up and release such a huge amount of tension that the tears will flow. The shoulders and hips store so much stress and emotional “junk”, and when we open those areas, sometimes the flood gates open. Welcome it! Let it flow and see how much better you feel after. And if you get an opportunity to catch some waves, do it…see how relaxed you feel after a nice day on the water. Whatever it is for you, find your cure. Find the thing (or things) that can help “unstick” you and get you flowing into the groove again. You won’t be sorry! How do you end the majority of your days? Do you find it easy to just let the day be what it was, let it go, and then go to sleep in anticipation of what tomorrow will bring? Most likely, you spend some time — maybe even LOTS of time — mulling things over in your mind, worrying about whether or not you made the right decisions and creating stress for yourself. It’s hard to let things go, because life puts so much pressure on us, constantly giving us more and more to worry about. However, taking some time each day to center yourself — to focus on one thing that is important to you, for instance — can do wonders for helping you deal with the pressures and stress life throws your way. You can practice centering yourself in a variety of ways, like focusing on your breath, meditation, journaling — there are lots of ways. The important thing is to find an activity that helps you focus on what it is you’re trying to accomplish. From a physical aspect on our mats, we often refer to our core as our center. Our core is made up of the transverse abdominis, rectus abdominis, internal obliques, external obliques, the erector spinae, the glutes and the pelvic floor muscles. These muscles provide stability and support for our bodies — it’s our foundation that helps us move and bear weight, so it’s important to make sure it’s strong and supple. This week in class, we’ll be focusing on poses that strengthen our core, and we’ll also spend time digging in to how the core works in each and every pose we do. Learning how to incorporate a strong focus on the core when we’re on our mats will not only help you avoid common injuries, but it may also help you cultivate intelligence and strength beyond the mat — with centering yourself. May 15, 2012 in Health | Enter your password to view comments. Have you ever noticed how your body reacts when you’re tense? For many people, they notice their teeth will clench, their shoulders will tense, their breath becomes erratic. Many of us notice our bodies react in this way when we get stressed in a particular situation life throws our way. And when this happens, we may notice we tend to panic, rush to “fix” the problem, place blame (many times incorrectly), and/or overreact. I know that, personally, I am guilty of all of this. I can give you instances where I’ve experienced every single one of these physical and emotional reactions to stress. Just so you know, the same thing can happen when we’re on our yoga mats. For example, if you’re attempting an extremely challenging pose, you may notice your teeth clenching and your shoulders tensing. You may also notice you’re gasping for air or holding your breath. Ever tried to get into Astavakrasana (Eight Angle) Pose? I definitely catch myself doing these things when I am working on taking a particular pose to the next level, or trying a new pose for the first time. I’ve attempted Astavakrasana Pose several times, to no avail, and I’m clenching the teeth, tensing the shoulders and holding my breath EVERY time I try it! When I take the time to stop and pay attention to my breath and my body in every pose, to take a moment to re-set myself both mentally and physically when I notice these things happening, my practice always brings my body, mind and spirit to a much more serene space. My soul literally feels rejuvenated. But something intuitively told me that I needed to pursue the practice of yoga. That yoga was just what I needed. So I started out, like many people, by doing yoga to a video in the comfort of my own home. And eventually, I started attending a live class, because my intuition told me that I need someone to look at me and help me progress to the next level. And I’ve never looked back. It has been wonderful being in a class with others, because as I look around the room, I always notice someone else who’s just as tight as me in a particular pose. Or I’ll notice someone who seems to have just as hard a time with the breathing and meditation piece of class as I do. It is refreshing to know that I am not the only one who has trouble! I know yoga is not about competition, but still. You know what I mean. Lately, I have been trying to get better at the meditation and breathing exercises that are part of yoga. If you’ve been reading my blog for any length of time, you know about the medical issues I am dealing with, and the stress from it all has finally caught up to me. And because my body is in so much pain, I need to really take an opportunity to morph my own yoga practice to be a bit more on the gentle side. Last week, I attended a five day yoga Vinyasa Yoga certification. It was amazing, and I learned so much about the Vinyasa style of yoga that I didn’t know before. But the thing I enjoyed the most about the training is that we incorporated LOTS of breathing and meditation exercises into each and every day. Some of the breaths I knew, and some were new to me. And I realized very quickly that I REALLY need to focus on the more meditative aspect of yoga. I had a really hard time with the 4-Part Breath…this is when you breathe in for a particular count, hold the breath for that same count, breath out for that same count, hold for that same count…and then repeat. It was the last part that I had the most trouble with. I could do the first three parts, but that 4th part was unattainable for me…it was a struggle to even TRY to hold my breath after breathing out. I don’t know why, but it just was. So I realized then and there that this was the missing piece of my practice. Three times since then, I’ve practiced this breath…I found a really good guided meditation on iTunes and have been trying to perfect it, last night being the most recent. It still eludes me, that last part. Hmph! This week in class, we’ll be working on this breath. It’s a tough one, I won’t lie to you. Many people I’ve talked to say that it was tough for them, but they said that once they figured it out, it was amazing how they felt! So, if you’re in class with me this week and this breath eludes you as it has me and others, know that you are not alone. You’re never alone. We are on this journey together.